Attorney points out that as Israelis are forbidden to enter Judea and Samaria's Area A, Arab-Israeli soccer team is breaking the law. Attorney Itamar Ben Gvir has penned a letter imploring Attorney General Avichai Mandeblit to scrap a Thursday's soccer game between the Arab-Israeli Hapoel Umm Al-Fahm and a local Jenin team. According to Ben Gvir, the match is illegal because it takes place in Judea and Samaria's Area A. As per the Oslo Accords, Judea and Samaria was divided into Area's A, B, and C. While Area C is controlled entirely by the IDF, Area A is under Palestinian Authority rule. 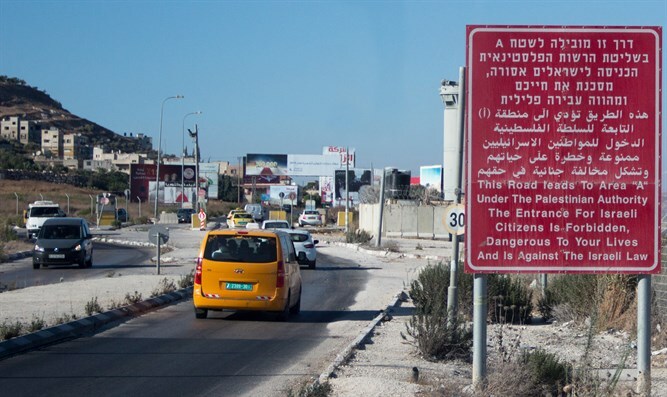 Israeli citizens are prohibited from entering Area A, with large red signs warning that Israelis caught in the area are subject to criminal prosecution. Ben Gvir alleged in the missive that enforcing the ban on Israeli Jews was discriminatory, pointing out that Hapoel Umm El Fahm's Jewish players were told not to attend the game due to threats on their lives. "Discrimination is the mother of all sins," wrote Ben Gvir. "I remind you that Umm al-Fahm is a city in the State of Israel and its Arab players are Israeli citizens". "In light of these things, I demand that you instruct the players of the group not to enter Area A, and if they do so, I ask you to investigate the management and the players and prosecute them," continued the missivre. "It's clear that if you do not, it will create a legal precedent stopping the future prosecution of Israeli Jews who enter Area A."